... Moreover, there are many countries that I find preferable. Germany, for one, comes to mind. ...this country shows a disregard for the past. That the city permits pigs like Macklowe, Solow, Zuckerman, etc. to raze pieces of our history is sickening. It would not happen in Europe. well ... germany didn't really have much of a choice in that regard b/c many of its historical structures were razed in the course of a certain historical conflict that country helped create ... and much of europe suffered similar losses due to that conflict. anyway, its much easier to preserve historical structures when only a subset remain due to a war that wiped out many. I did not say that I prefer Germany to the US because of its preservation of historic architecture. I said I regard Germany as a better country than the US, in general. ^ Looking through these pictures i think its a real shame these buildings were destroyed. It would be interesting to see what replaced them. I've noticed that when a beautiful old building is demolished (which ever country), it's usually replaced by trash. IN his book “Building Memory in New York,” to be published by the University of Minnesota Press later this year, Randall F. Mason devotes an entire chapter to the 1807 St. John’s Chapel on Varick Street, which survived demolition threats for more than two decades until it finally fell in 1918. St. John’s Chapel, around 1910, was built in 1807 by Trinity Church and had an oak tower and fine interior details. The Trinity vestry later sought to demolish the chapel, but the city tried to intervene. The vestry eventually prevailed, and the chapel was demolished in 1918. 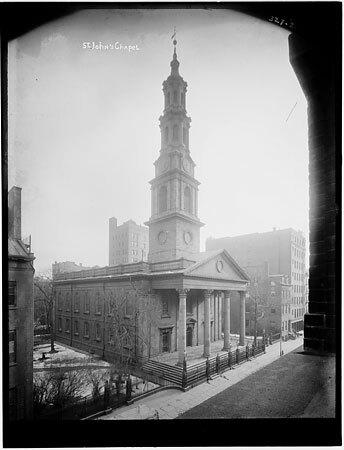 Just after 1800, Trinity Church began developing land it owned in what is now TriBeCa, creating a private park bounded by Hudson, Varick, Beach and Laight Streets. Named St. John’s Park, it was meant to attract residential development, and was soon accepted as an elite locale. Its centerpiece was Trinity’s magnificent ecclesiastical outpost, St. John’s Chapel, which dominated the skyline from its position on Varick Street, facing the east side of the park. Despite the satellite status of St. John’s, Trinity built ambitiously. The chapel’s architect, John McComb, was also at work on City Hall, and the tower of this Georgian-style church rose 214 feet when finished in 1807. The portico and columns were made of reddish sandstone, the sides and rear of Manhattan schist stuccoed over. As for the tower, according to most period accounts it was made of oak. In 1912, The Real Estate Record & Guide reported that the chapel’s delicate Corinthian capitals had been the first in New York to be carved from stone. However, in 1867 the vestry of Trinity, an Episcopal church, sold off the park to the Hudson River Railroad Company, which replaced the polite village green with a massive rail freight terminal. This led to a general exodus, not only of St. John’s Park householders but also of chapel parishioners. Noting residential migration uptown, The Real Estate Record & Guide reported in 1890 that residents had long ago begun “to think it vulgar to live among the packing boxes, and to inhale the odor of fresh fish and tarpaulins.” Two years later, The New York Times reported that the Trinity vestry had decided to demolish its colossal chapel. Holdouts at St. John’s — few of whom still lived in the neighborhood — resisted the parent church. The Times said one of those holdouts — the pastor of St. John’s, the Rev. Dr. Philip A. H. Brown — was even known as the Fighting Vicar. Dr. Brown died in 1909, the year that pro-demolition candidates won a vestry election at Trinity. Yet St. John’s hung on despite them; it was finally the City of New York that brought a close to its story. The Board of Estimate decided in 1912 to widen Varick Street, in part for a new subway extension. At the time, The Record & Guide noted that St.
John’s was down to one service a week, a 7:30 a.m. Sunday communion. The road-widening project moved forward amid growing cries from architects and historians for the preservation of the chapel. In 1913, George McAneny, the Manhattan borough president, introduced a resolution to save the church by running the sidewalk and part of the street under the columns of the portico, which would be allowed to jut out into traffic. He even spent $15,000 to have the designs prepared, and an old photograph seems to indicate that work was undertaken. But the key obstacle was Trinity Church, which wanted to capture the value of the land. But the Board of Estimate would not approve the sidewalk reconfiguration unless the project stipulated an actual use for the church. Trinity’s vestry shrewdly offered to give the chapel structure to anyone who purchased the land. 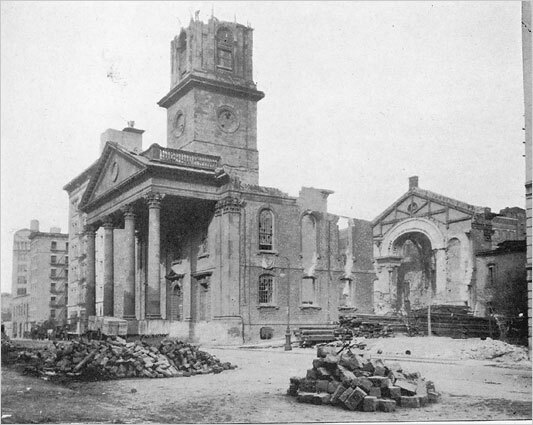 Finally, in 1918, a quarter-century after the matter arose, St. John’s Chapel vanished and Trinity put the site on the market for more than $200,000. 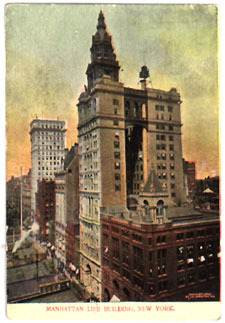 It was replaced by the commercial building that still stands at 50 Varick Street. Dr. Mason, an associate professor in the School of Design at the University of Pennsylvania, has found the case of St. John’s Chapel particularly significant because of Borough President McAneny’s deep involvement in trying to preserve it. Not only did Mr. McAneny put cash on the table, but it appears he also delayed the road widening as long as possible. He was no idealist, but a banker and civic leader instrumental in the 1916 zoning resolution, subway extensions, civil service reform and other issues. Also, looks like the Twins were just built back then. Note the then pretty much vastly empty landfill spot onto which Battery Park City the WFC sits today. Didn't an American build the original building in the first place? I think London ment more of less that today's generation is. This country and city built some great structures but in recent years greed and other elements have gotten in the way of good thinking. Im of the belief that if the Coliseum was in NY and not Rome, it would be gone by now! [QUOTE=londonlawyer;212825]This gem was razed to make way for Vornado's filthy, disgusting 330 Madison. The Kahn & Jacobs building dates to 1964; replaced the Manhattan Hotel as well as the National City Bank. 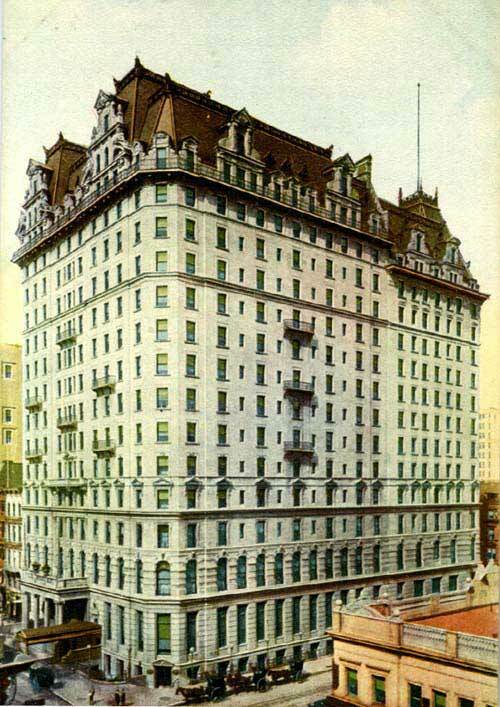 The Manhattan Hotel was where Sigmund Freud stayed in August 1909 on his only visit to the United States. In May 1916, Sen. Warren G. Harding began his affair with Nan Britton here--a relationship that continued after Harding was elected president. The 41-story tower at 330 Madison Avenue at 42nd Street that was designed by Kahn & Jacobs and built in 1964 by John J. Reynolds, a real estate broker who handled much of the real estate interests of the Roman Catholic Archdiocese, was the worst thing that happened to the avenue in decades as its banal "modernistic" design was like throwing a plastic sheet over fine furniture. It insulted and besmirched the fine masonry quality of the avenue in midtown. Last edited by Scraperfannyc; May 2nd, 2008 at 03:30 PM. It needs it. But these recladding are starting to get boring, I would love to see some variation, perhaps some cuts/slashes in the fascade, a change in the structural elements of the original building as well. Hi - I am from Germany and I am a fan of the gone NYC too. While I searched for material about the Equitable Building (Cedar St / Broadway) opened 1915, I got more and more interested about the first Equitable Building, placed there from 1870 to 1912. I attached some pictures from the old building I found in the www. The last two pictures were made after the building burned down in 1912. Sorry it's in German language, but my sources were in English and are linked at the end of the post. Here are some pictures I found of the Manhattan Life Insurance Building, another part of the old Manhattan, build in the years 1893-94, gone in 1930. Last edited by Schaedel; August 24th, 2008 at 11:00 AM. Reason: I forgot some parts of the text. Thank you for posting these pictures they are very interesting. Can anyone name the building under construction, in the first picture? More on the Manhattan Life Insurance Building. Wishing to create an architectural symbol to outshine its rivals, in 1892 the Manhattan Life Insurance Company held a competition for its new headquarters at 64-66 Broadway across from Trinity Church, selecting architects Kimball and Thompson. Partially speculative and thus a money-maker for the company as well as an image maker, the structure was intended to be the tallest in New York. When finished in 1894, the granite, terra-cotta, and brick-clad structure rose 348 feet above the sidewalk to the structureÕs lantern top. On its high floors a copper-clad iron bridge spanned the light court of the U- shaped building, which featured several engineering firsts, including the use of pneumatic caissons for the foundations, designed by engineer Charles Sooysmith. The interior was heated and cooled through one of the first uses of electric ventilation. Hi Brianac - I think it is the American Surety Building. and here is source of the picture above. I like it, because there was also pictured the old Equitable building on the left side of the building.